I am Dipanjan Bhadra, an otherwise regular guy of 22 years of age. I am suffering from Stage-IVB cancer. I need 75 lakhs for my treatment in order to have the hope of leading a normal life like every other person. This is also to let you know that my father passed away when I was at a tender age of 12. He too was a victim of the same disease, and my family(me and my mother) is battling with the same cruel disease twice in the same lifetime at a span of 10 years. My mother is a housewife, and we do not have any source of income right now apart from my father’s savings more than a decade ago. I am the only child in my family. Despite losing my father early in my childhood, I battled the odds to become an engineer. Just when things started to brighten up for me and my mother, and when every young guy starts believing in a dream, things started heading for the worse. I was diagnosed with cancer. 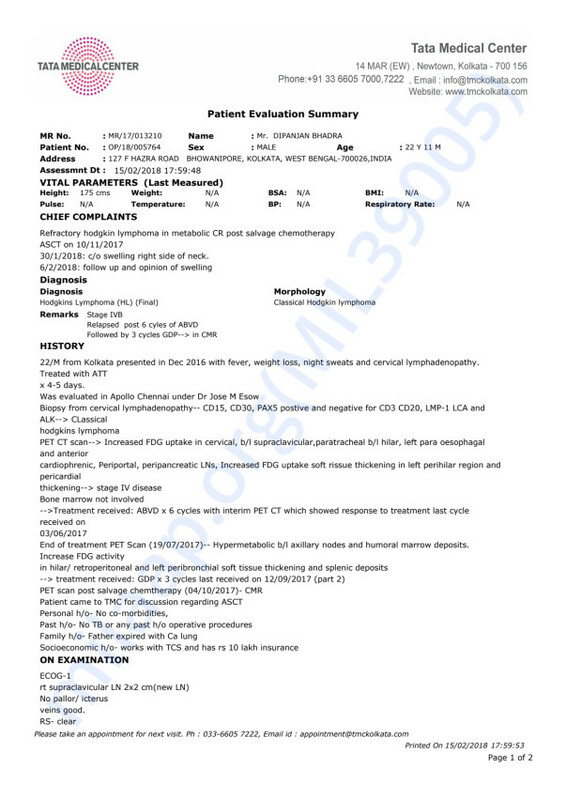 Part-1 of this treatment is brentuximab vedotin + bendanustine for 3 to 5 cycles for which I need 35 to 40 lakhs. Part-2 is for allogenic stem cell therapy which will cost me 30-35 lakhs. So this aggregates to around 70-75 lakhs in total. This is me reaching out to you, pleading to help me with whatever you can at your earliest. Time is very precious to me and with every hour the clock is ticking. I request you all to please kindly donate for my cause, if not, my mother’s cause and fulfill my mother’s dream. I am the only hope to my mother right now. No mother deserves to have her husband and only child taken away by the same disease by her mid-age. Thank you. 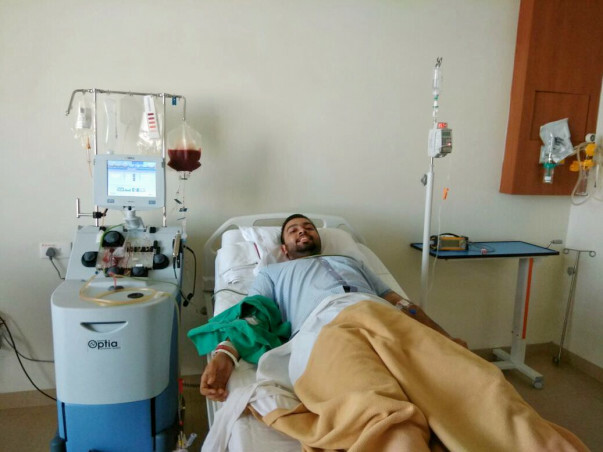 My transplant was scheduled on 24th of June but it has been delayed because of lack of funds. Now, I will be getting admitted day after tomorrow to undergo the surgery. My cousin has been matched as a potential donor. Thank you much for your support, we shall keep you all posted. I am pleased to announce that my treatment has begun as of 31st March. IMy condition was deteriorating for 2 weeks before that and thereafter was prescribed a Fentanyl patch which had me drowsy for 72 hours each time and therefore was unable to be active enough to post updates. But after 31st and my first dose of chemo immunotherapy I have been feeling a lot better. I feel fitter, sharper and more confident than before. My next dose is on 20th and i extremely thankful to everyone who donated. I was extremely overwhelmed by the response i got you people and i thank you from the bottom of my heart. Let's demolish this bloody disease with your combined efforts. Thank you so much for your love ans support. I am awestruck by the support I have received from you people. Your support and positive energy are keeping me going. I have been very busy of late, I am either in the hospital (it has kind of become my second home right now) or trying around to gather some funds. I haven't been able to reply all, I am sorry. Hope you understand that I barely get the time to reply to all of you. However, I am indebted to your support and encouragement and that's been something that has kept me going. A very big thank you from the bottom of my heart. I plead with you to keep sharing since its still a long way to go, but I am sure with the amount of support I have received from you I will get somewhere.